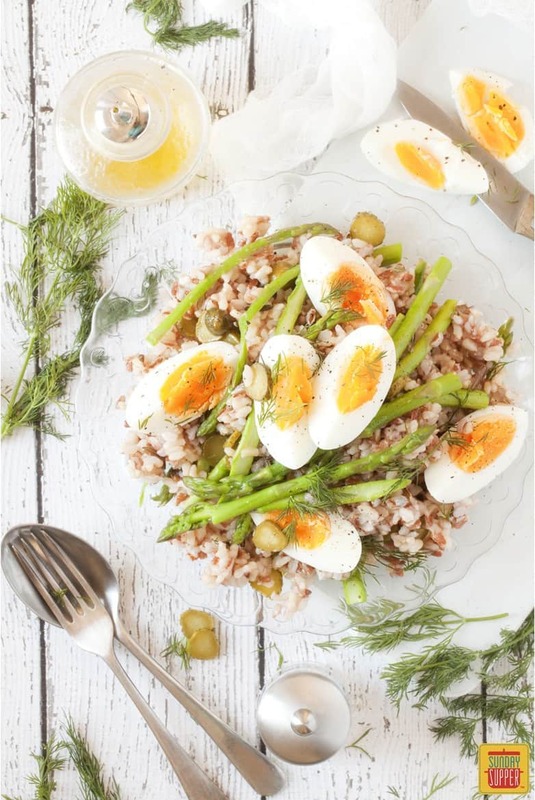 This make-ahead Asparagus Salad with Rice and eggs is BRIGHT, EASY to make, and a DELICIOUS side to serve alongside your Easter centerpiece. This week we’re bringing you Easy Easter Side Dishes that will make your springtime entertaining very easy! 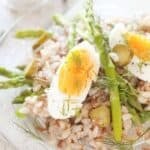 This Asparagus Salad with Rice has been created with Easter and versatility in mind because having a few easy Easter side dishes on standby can only ever be good news. When I think of Easter, aside from chocolate eggs, my mind wanders to thoughts of a traditional roast lamb dinner. It’s what I grew up with. But times change and these days not everybody (me included) sit’s down to a classic roast over Easter. Lamb may still be popular, but our ways of cooking & serving lamb are more varied than ever before and this vibrant salad is here to ring the changes in our lifestyles. 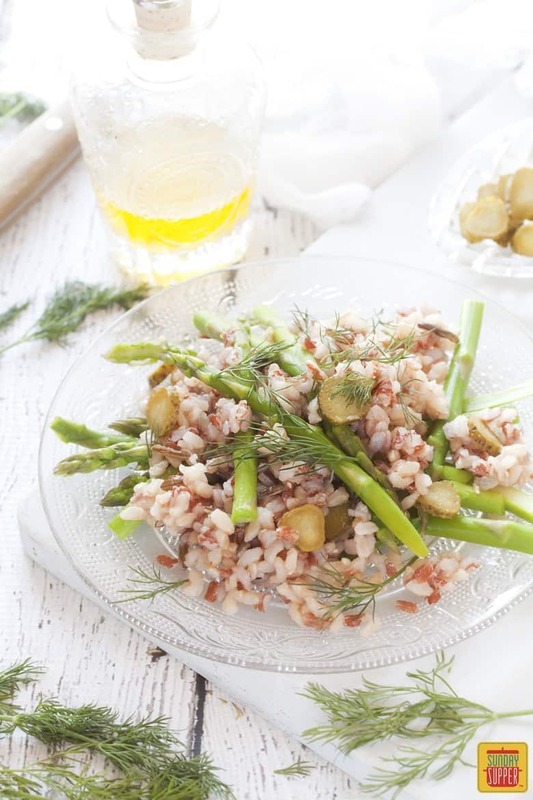 This simple asparagus salad could be served alongside a joint of roasted meat served with several other vegetable dishes and salads or as part of an Easter buffet. It’s also meat free, so it’s suitable for serving to almost everybody. A plateful of Asparagus Salad with Rice is a real celebration of all that Springtime has to offer. Asparagus is at it’s best around Easter time and shines brightly in this fresh salad. And since this salad comes adorned with slices of egg cooked to keep the yolks adorably soft and creamy, it’s a perfect side dish to serve over Easter. I used a mixture of rice – predominantly brown rice with a little wild rice included. 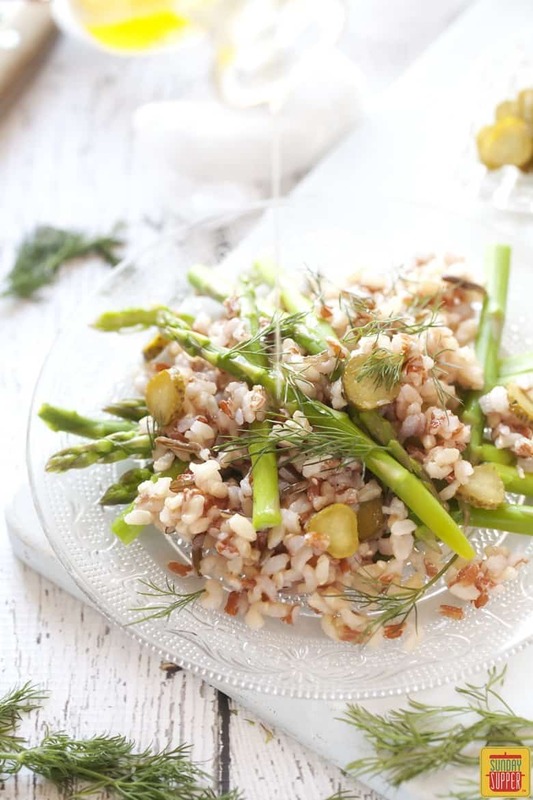 However, this Asparagus Salad can be adapted to include just brown rice, red rice, or black rice. Or any variation in quantities of the three. The choice is yours. 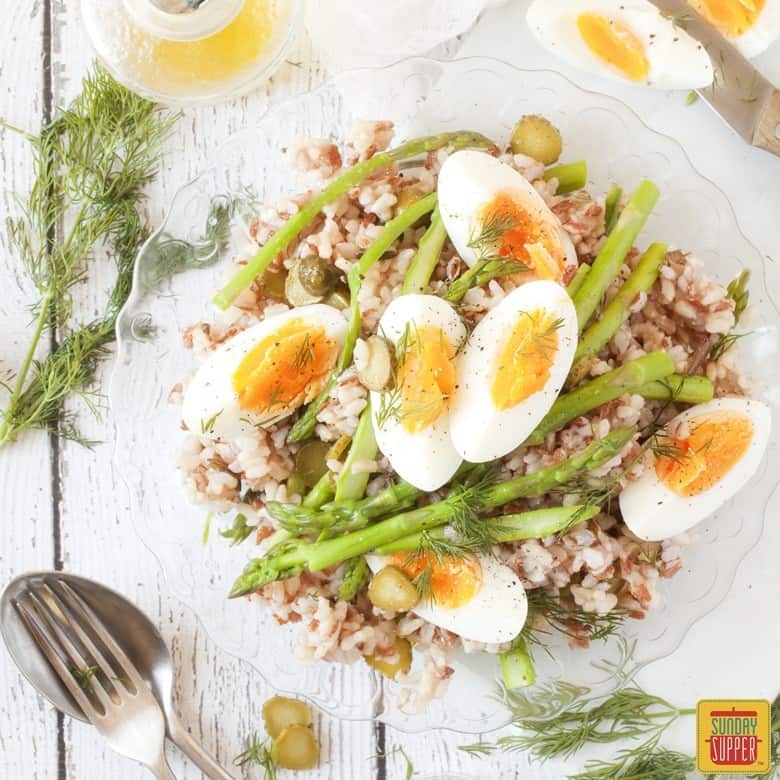 I personally wanted a fresh, wholesome look for this asparagus salad but serving the vibrant asparagus and those soft, creamy eggs on black or red rice would make for a striking visual effect. Play about. Cater to your own whim. 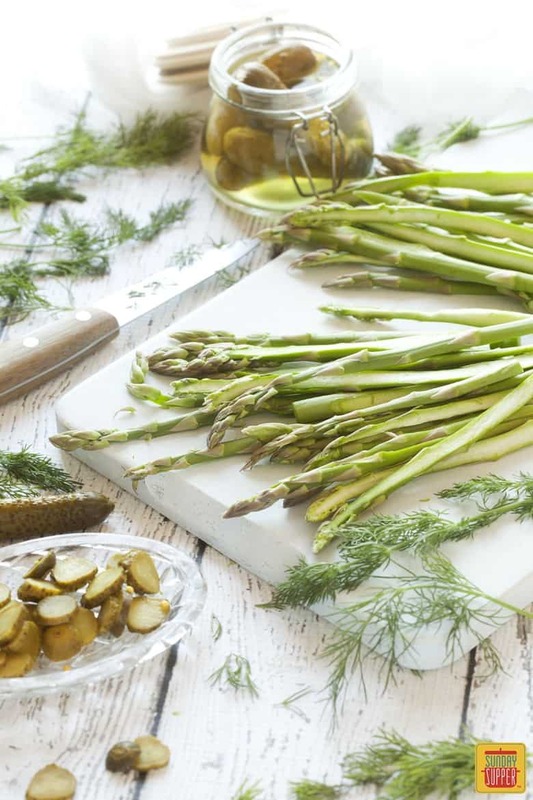 Sliced gherkin and a light sprinkle of dill bring added punch to this asparagus salad, along with a simple vinaigrette. My suggestion is to mix just half of the dressing into the salad and allowing diners to top up their dressing at their own discretion. The cooking time for this recipe is approximately 45 minutes. That may seem a long time for what is a simple recipe. But do not be put off. The majority of that time is for the rice to cook. This means you’re free to float around your kitchen preparing other things for at least half of that time. Actual hands on time for this recipe is around 15 minutes. So, despite first appearance, this salad really is quick and super easy to prepare. However you like to dine over the Holiday, this easy Asparagus Salad is sure to be a welcome, fresh take, on proceedings and to be a valuable addition to your repertoire of easy Easter side dishes. 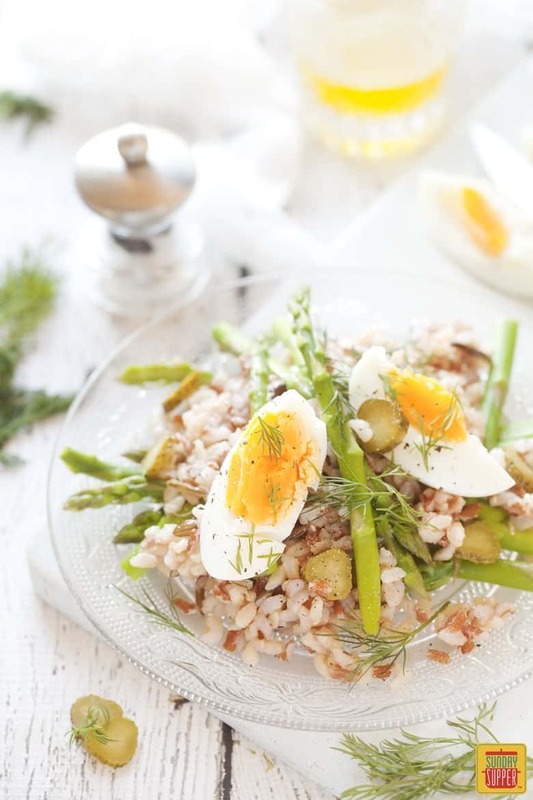 This make-ahead Asparagus Salad with Rice and eggs is BRIGHT, EASY to make, and a DELICIOUS side to serve alongside your Easter centerpiece. I used a mixture of mainly brown rice with a little red & black wild rice, but any combination would work out fine.